When you throw together for exhibit a random assortment of diverse religious artifacts from three distinct religions over several millenia, people will wonder, Why? What's the point? Edward Rothstein writes a comprehensive and sensitive review, to describe and explain the exhibit, "Abraham’s Progeny, and Their Texts" saying, "The sweep of the new exhibition at the New York Public Library — 'Three Faiths: Judaism, Christianity, Islam' — is stunning. It stretches from a Bible found in a monastery in coastal Brittany that was sacked by the Vikings in the year 917, to a 1904 lithograph showing the original Temple Emanu-El on Fifth Avenue. It encompasses both an elaborately decorated book of 20th-century Coptic Christian readings and a modest 19th-century printing of the Gospels in the African language Grebo. 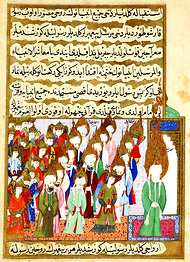 There are Korans, with pages that shimmer with gold leaf and elegant calligraphy, and a 13th-century Pentateuch from Jerusalem, written in script used by Samaritans who traced their origins to the ancient Northern Kingdom of Israel..."
The focus on similarities among the three religions is partly meant to disconnect terrorism from the mainstream Islamic tradition. In the British catalog, Karen Armstrong, who has written widely about the Abrahamic religions, minimizes the scale of Islamist violence by suggesting that each religion has its dangerous extremists, but more important, she argues, is that the faiths share a devotion to the ideal of transcendence through holy texts. The British exhibition even had the subtitle “Discover What We Share.” And in New York, too, the emphasis throughout is on commonality. At this historical moment, this is meant to defend Islam against anticipated accusations. Thus: out of three distinct monotheisms, one humanist perspective. We think this exhibit sounds just wonderful, but has been misnamed. It should be called the, "We are all Alike, so Please Don't Blow Us Up" Exhibit. Is an Orthodox Stance Jewish? Is Booker Prize Winner Howard Jacobson Jewish? Do politicians lie about religion?